KU Leuven’s Sprint awarded in 2015 cross-validates n-Auth technology on Active Directory-based platforms with a focus on integrating n-Auth server components with application backends. There are several existing technologies available, such as OpenID Connect, OAuth, SAML and others, that target specific n-Auth features including instant logout and transaction approval. The perceived benefits to users are convenience and usability, as well as control over authentication with no tracking. For service providers and integrators, it presents an opportunity to reduce the impact of authentication data leaks with easy integration, low deployment cost when delivering secure mobile solutions. A summary of the project was presented for review at the Zürich working group meeting in September 2016. The Sprint awarded to Trustseed in partnership with Microsoft demonstrates the use case of the legal proof of e-signatures applied in the context of TDL membership agreement. The goal was to demonstrate the link between e-Authentication, e-Signature and e-Validation. Trustseed’s qualified electronic signature creation device was integrated in this context with Microsoft Azure’s end-user authentication and Certiway validation platform. This new generation of online signature in SaaS combines strong authentication (multi-factor combined supportive document control), with document compliancy analysis, before e-sealing and e-signing, the whole process being overseen and accredited by a trusted third party. Legal archiving is a plug-in function that naturally can extend the existing Sprint implementation. 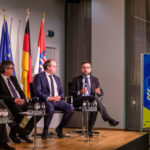 The Sprint is the basis for a trustworthy modular framework that could securely, confidentially and in compliance with the EU eIDAS regulation, handle and connect heterogeneous digital document management accredited communities. Following in Trustseed’s footsteps, miiCard’s Sprint award was aimed at integrating a mechanism to provide trusted identities for e-Signatures on top of TDL’s GTAC platform. Specifically miiCard showed that a scalable, cross- border trust framework can be used for purely online transactions that require a higher level of assurance than traditional document or data checks. The e-Signature requirement was to use verified attributes from government-regulated attribute providers. Primary trust was obtained from a combination of a bank’s existing strong authentication, its validation of data attributes and identity as well as live financial data (to increase traceability). A user was expected to use strong authentication to acknowledge consent. Integrated into TDL’s existing membership on-boarding processes, miiCard demonstrated how an LOA3 ‘bank verified identity’ can break new ground in the use of institutional actors for legal proof e-Signatures.